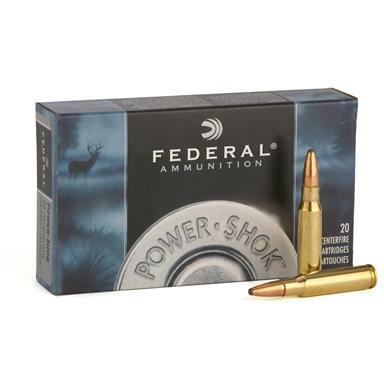 Federal Power-Shok 7mm Remington Magnum, SP, 150 Grain, 20 Rounds is rated 4.6 out of 5 by 16. Rated 5 out of 5 by Straight shooter from Long Range Sniper I was able to reach the 1000 yard targets repeated amount of times! Great value!!! Rated 5 out of 5 by 3rd year hunter from Awesome ammo!!! Bought this to sight in my rifle and decided to try it hunting with my 7mm. I was so full of adrenaline when this 8 pointer walked in and full of excitement that I missed by 18" to the right of where I was aiming and hit an artery rather than his lungs where I was aiming. The bullets expansion ripped a nice hole and he dropped right in his tracks. This ammo has given me the same results as most here with tight 1" groups at 100yds. I will use nothing else. Rated 5 out of 5 by 1weatherby from extreme accuracy I recently purchased a new weatherby 7mm rem mag , and bought a box of 150 grain and a box of 175 grain federal hi shok bullets , too compare the accuracy , there was no comparison the 150 and 175 grain shot 1/2 inch groups at 100yds ! Exceptional accuracy out of a new rifle with these bullets.Anxious too see how they work this spring on bear. Rated 5 out of 5 by TOPQ from Accuracy Ammo grouped at 1.5 inches at 200 yards and dropped my mule deer at 300 yards. Whats not to like? Rated 5 out of 5 by Smitty421 from Great accuracy great price Used the power shock in a 243 for a long time with good results. Went to 7mm Browning A-Bolt a few years ago and tried some high price bullets but went back to the power shock because of the accuracy. The high price bullets could not give me the 1/2" groups like the power shock could. I have dropped plenty of whitetail from 40 yards to 200 and past most have dropped instantly the ones that ran haven't made it far. Will use this product as long as they make it. Rated 5 out of 5 by JimS from 1/2 inch group! I bought this ammo for the price to sight in my new T3 Tikka 7mm. I was surprised to group the first 3 shots in a half inch group. I made adjustments to my vortex scope and put the next three shots in a half inch group at 1.5 inches high at 100 yards. I have never sighted a new rifle in that easy before. I usually hand load but decided to use the soft point 150 grains while hunting mule deer in Montana. I dropped a 4x4 with one bullet at a 250 yard downhill shot. 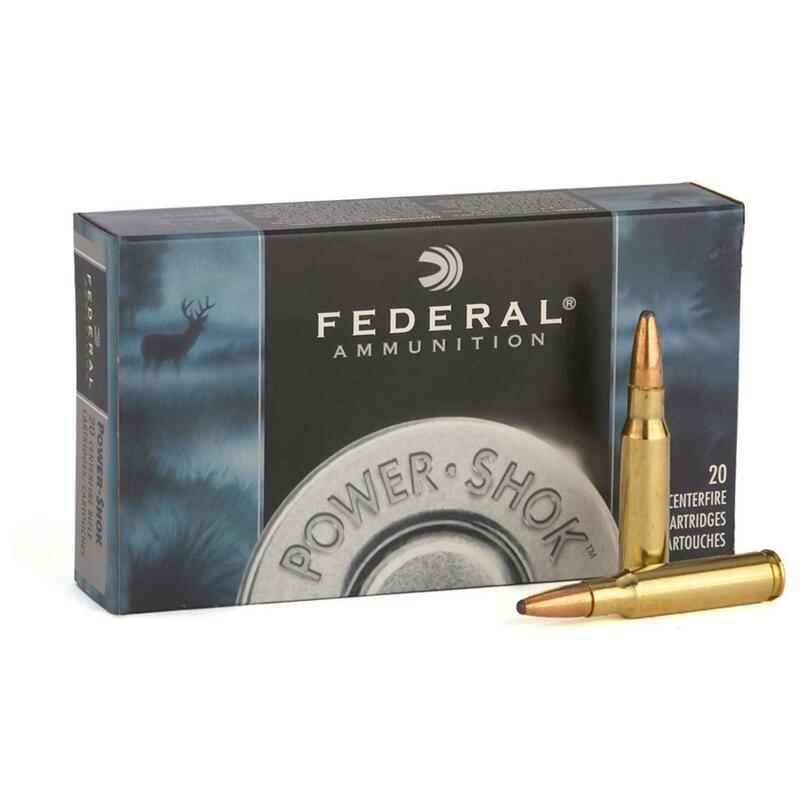 No need to hand load excellent ammo for the price. Rated 5 out of 5 by Sapper129 from Amazing Factory Ammo I usually hand load all of my hunting ammo until last year I bought a new Tikka T3 and bought a box of the 150 gr Power-Shok just to sight in a new scope because the price was right. I was floored when I was consistently shooting Sub MOA 3 shot groups at 100 yds. I went out and bought 4 more boxes and decided to hunt with it. I had no problem dropping deer in their tracks out to 200 yds. I have learned if you find a load your rifle likes, shoot it! This is definetly the right one for my Tikka when deer hunting. Affordably priced and great performance.